For high performance sports cars. Driving precision with DuPont™ Kevlar&reg. The Dunlop SportMaxx TT is powered by DuPont™ Kevlar&reg. Drivers of high performance cars want to experience the dynamics of their vehicle. To experience this requires superior dry handling, high-speed stability, excellent acceleration and reduced braking distances. Dunlop has created the SP SportMaxx TT ultra high performance tyre to provide outstanding grip and driving pleasure. Precision handling, powered by DuPont™ Kevlar® - for high performance sports cars: Driving precision with DuPont™ Kevlar®, superb handling and cornering, excellent grip and braking. Excellent grip and braking ability. Enjoy superior grip and shorter braking on wet and dry, thanks to a unique tread compound containing motorsports derived nanoparticles. The asymmetric groove arrangement enhances grip further, giving you more control at motorway speeds. Driving precision with Kevlar® technology. The SP SportMaxx TT benefits from DuPont™ Kevlar® technology to bring performance to a higher level. This tough compound creates a stiffer sidewall, leading to improved driving precision. Dunlop Touch Technology ensures high levels of responsiveness and road feedback. Superb handling and cornering. The tread design of the SportMaxx TT manages the pressure across the tyre more effectively, improving handling performance on wet and dry. Smooth transitions from straight to curve give you more time to feel the road and react, even at high speeds. Stiff shoulder blocks add extra stability when cornering. Specific bead seat system. Strengthens the link between tyre and rim for a more precise driving experience. Like the grip between your hand and the steering wheel, the Specific Bead Seat System enhances control and conveys outstanding road feedback. Benefits Enhanced road feedback; greater stability and precision. Silica-Plus Compound. A motorsport derived tread compound that delivers high levels of grip, particularly on wet roads and in low temperatures.Benefits Superb braking and acceleration performance; high grip in wet and cold-weather conditions; low wear and tear. Nanoparticles. Tread compound mixed with nanoparticles of racing carbon black. These nanoparticles are combined with resin and polymers to provide excellent adhesion on dry and wet roads.Benefits Superior dry and wet grip, precise braking, improved wear. Jointless Belt (JLB). A Hybrid Overlay Technology that reduces circumferential deformations at high speeds.Benefits Superior high speed stability. Maximum Flange Shield (MFS). A rim flange protection system. MFS employs a profile of rubber that runs around the circumference of the tyre above the wheel flange. This creates a protective buffer zone. * Benefits Protects expensive alloy wheels from kerbing. * Only available in select sizes. Variable land to sea ratio. 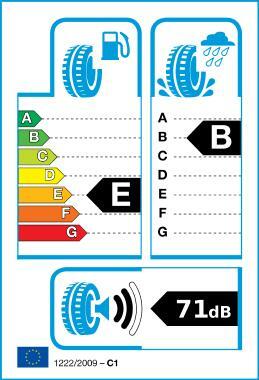 Asymmetric tread design with a variable land to sea ratio delivers high levels of aquaplaning resistance. The massive outer shoulder block ensures rapid and turbulence free water drainage, while also ensuring outstanding cornering stability.Benefits High aquaplaning resistance; increased road contact; enhanced cornering stability and steering precision. Asymmetric Tread Design. Asymmetric tread design provides improved handling and aquaplaning resistance. The continuous center rib increases stability and precision. The asymmetric groove arrangement enhances grip on wet and dry surfaces.Benefits Improved performance on straight lines and around corners. Flatter tread profile. The new generation of Dunlop tyres features a flatter tread profile with a 4-8% bigger contact patch, depending on size and type of tyre. A bigger contact patch delivers more stability and enhanced road feedback, allowing tires to respond quickly and precisely.Benefits Increased stability and steering precision; reduced heel and toe wear; excellent cornering stability and precision; superior dry grip. Multi Blade System. Winter driving conditions can vary greatly. From cold and dry to snow or sleet, these conditions make very high demands on a tyre. Dunlop’s multiple blade system meets this challenge head on, with different types of blades for varying winter road conditions.Benefits Consistent performance in various winter conditions. Dual Silica Compound. This compound improves acceleration performance and promotes low wear and tear.Benefits Superb braking and acceleration performance.